First Love Missions: Feast of Tabernacles – Celebrate God's Goodness! My (Mark) parents, Jim & Julia Chandler, were spear-headers in organizing the first International Christian Embassy's 'Feast of Tabernacles' in 1980. This year marks the 32nd anniversary of 'the feast' and now there are International Christian Embassy branch networks in 60 nations of the world. My folks left quite a legacy in Israel and are still known in Christian circles there to this day. Moses instructed the children of Israel to gather for a reading of the Law during Sukkot every seventh year (Deut. 31:10-11). King Solomon dedicated the Temple in Jerusalem on Sukkot (1 Kings 8; 2 Chron. 7). 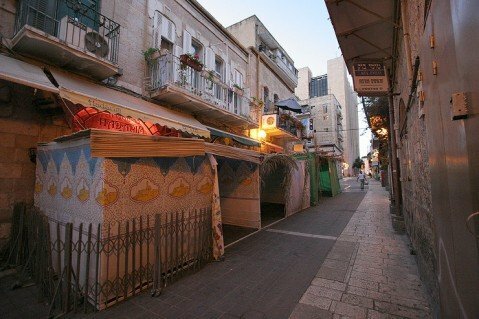 And Sukkot was the first sacred occasion observed after the resumption of sacrifices in Jerusalem following the Babylonian captivity (Ezra 3:2-4). In Leviticus, God told Moses to command the people: "On the first day you shall take the product of hadar trees, branches of palm trees, boughs of leafy trees, and willows of the brook" (Lev. 23:40), and "You shall live in booths seven days; all citizens in Israel shall live in booths, in order that future generations may know that I made the Israelite people live in booths when I brought them out of the land of Egypt" (Lev. 23:42-43). There were 6 annual Feasts called the feasts of the Lord. These were special times for God’s people to worship and come before Him. The complete lists of the Feasts is in Lev 23. They fall naturally into 2 groups – The first all related to Passover ( Unleavened Bread, First Fruits, and Pentecost ). In the second group, all observed during Tishri, the sacred seventh month, the feast of Trumpets, the Day of Atonement and the Feast of Tabernacles ( booths) – all called the Fall Feasts. We have just come through Yom Kippur last week. Now, my favorite time of year – the celebration of the Feast of Tabernacles. This feast – called Sukkot, was a time when all of God’s people come before Him to celebrate. When you come, you bring yourself – the best gift of all to Him. This is the time when we thank Him for the new birth. For the Jewish people, they build for themselves booths on their porches and live in them, calling to memory the years they spent in the wilderness, in tents, moving on in their pilgrimage through the desert. We are only pilgrims passing through this life. Because we have a Saviour, we can rest in the knowledge that He knows us each by name, and cares continually for us. This is the only Feasts that has a prophecy of coming glory attached to it. In Zech 14, we are told that the day will come, when all the nations of the world will come up to Jerusalem to celebrate the Feast. 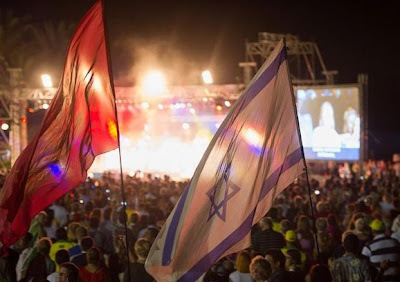 I have been in Jerusalem during this special time twice in my life. Believe me, there’s nothing like worshipping with people from around the world ! Very different and glorious to say the least ! Let me encourage all of you to continue in your prayers not only for this nation, but also for Israel. Remember, God chose Israel to be His special people. If you are a Believer in Jesus, you have been grafted into the olive tree (Israel). God is doing a work in these days, to knit together those Believers – Jew and Gentile alike. His name be praised! The word of God is exact. The woman of Rev 12 is now here. The woman is not a church, nor Mary, nor Israel, she is the prophet like unto Moses and Elijah Matt 17:3, Acts 3:21-23, Luke 1:17 delivering the true word John 1:1 from the wilderness to prepare a people for the Lord’s return. God our Father will not put any child of his into a hell fire no matter what their sins. It never entered the heart or mind of God to ever do such a thing Jer7:31, Jer 19:5. Turn your heart to the children of God. A gift is now delivered to the whole world as a witness Matt 24:14. http://minigoodtale.wordpress.com Prove all things. val, when you say that "God our Father will not put any child of his into a hell fire no matter what their sins." I hope that you're not going the route of universalism, saying that everyone, is automatically going to heaven, simply by virtue of being born. If you aren't, then what you've written could be misconstrued. If you are then I would answer that, yes, God's word is extremely exact when it comes to this subject. In John 14:6, Jesus instructs us "Jesus said to him, "I am the way, and the truth, and the life; NO ONE comes to the Father but through Me." It also says in John 3:16 that “For God so loved the world, that He gave His only begotten Son, that whoever BELIEVES in Him shall not perish, but have eternal life." Salvation is NOT a free ride open to everyone as a physical birth-right. God gives us free will to choose Him, or not. Those that do, go to heaven, those that don't, don't and DO go to Hell. It is just that simple. The word of God also says, in Hebrews 10:25-27: "For if we go on sinning willfully after receiving the knowledge of the truth, there no longer remains a sacrifice for sins, but a terrifying expectation of judgment and the fury of a fire which will consume the adversaries." So, even if we have 'been saved' and backslide into a life of sin, without repenting and returning to God, we will also burn in hell, along with those that have never known 'the truth'. The breathed word of God.